It's as pretty as a blue rose should be! The 3-3 1/2" rose-like flowers of this amazing plant are a real traffic stopper. 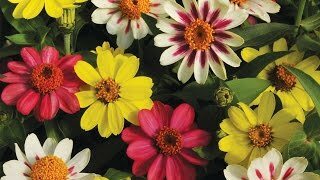 The intensity of the flower color softens as the blooms mature, creating a most beautiful display in the garden or vase. The species of this hardy and versatile plant is native to the American Southwest. It is as at home in the garden as it is in containers. Plants grow up to 36" tall and should be grown in a loose, well-drained soil in full sun. Lisianthus tend to be narrow, upright plants and can be spaced 7-10" apart. They look best planted in groups. This annual may act like a perennial in warmer climates. Dig a hole for each plant, approximately 6-8 inches apart large enough to amply accommodate the root ball. Lisianthus is grown primarily for its stunning, long-lasting cut flowers that look like roses. The shorter cultivars are attractive in containers. All types may be used in borders or as edgings, as long as they are spaced closely together. Plants are resistant to heat and humidity. Protect taller varieties from the wind. Pinching can encourage bushier growth. Lisianthus, The Blue Rose® is rated 4.5 out of 5 by 13. Rated 3 out of 5 by Joefish from Fair Half of them died. All planted the exact time and way. Would not buy them again. I have been planting gardens and flowers for 40 years and am not a novice. Rated 5 out of 5 by Jestersmaster from Worth the Money! I had been wanting to try these for years and finally did this summer. They were beautiful plants. I did lose a few. I got the mix of three colors. They really do last a long time on the plant and as cut flowers. They are really beautiful and my twin three year old granddaughters ask for those first when I take them to the garden to cut flowers. I have also seen them at the florist in arrangements and they are gorgeous. I will buy them every year - as plants - I understand they are extremely difficult to grow from seed. But I think I will try seeds anyway at least once. They don't take up a lot of room as the plant itself is not bushy. Rated 5 out of 5 by jetjo from Beautiful Flowers Not really blue, but a deep purple, these are stunning flowers. They stay very well for 5+ days in mixed bouquets. Next year I'll get a mix of colors and keepthe bouquets coming. Rated 5 out of 5 by MelD from Summer Bloomer for English Cottage Style Garden I have an English Cottage style garden and these are a perfect addition. They are beautiful! Most of the flowers I grow bloom in the Spring so these are great to have blooming in the summer time. The weather here has been very hot (90 - 100 degrees) and these flowers don't mind at all (you have to water of course but they don't wilt at all from the heat). I also planted the Pink Bouquet Collection and they worked just as well. Rated 5 out of 5 by SilverSpoonCelebrations from Great Success! I was a little worried by some who said these didn't perform. They arrived in perfect shape and bloomed prolifically starting in Late June-July. Used them in bouquets for an August wedding. Very satisfied. Rated 5 out of 5 by Frode from Growing well My wife loves "blue" so I picked these up and we have them growing in a pot on our patio. First bloom this morning (July 5th) but I planted later than I probably should have. Product arrived in great shape. Rated 5 out of 5 by eggplant007 from LISIANTHUS I used to buy them as cut flowers in the supermarket and was delighted to find plants a few years ago. I have the purple and white varieties and I overwinter them in the house. I cut them back in the fall. They don't do much all winter, look rather peaked but hello, when the weather gets hot they spring right back and grow like crazy. Obviously I have them in pots and they like it hot and thrive when other plants burn up. I water them everyday, twice a day when temperatures reach the 90ties. Yes they tend to flop but I stake them so they trail. This year I decided to buy some more and will mix them with sweet potato vine, should be beautiful. I also found a few seedlings sprouting up in pots 20 feet away, which makes me believe that they are easy to grow from seed. Rated 4 out of 5 by CrystalBeachMom from Beautiful BUT..... They are not BLUE. They are purple. I bought these for my daughter's upcoming wedding. Her colors are blue and white. She wanted blue roses VERY expensive. We found these and thought close enough and we thought it would be a fun project for us. I have pampered these plants. They are beautiful flowers, I have staked and loosely tied them to keep them from flopping over. I have a stunning display of PURPLE rose lisianthus. Too bad they are not blue.